In between rounds at Rock Ridge yesterday I took a stroll back into an area of the forest we don’t normally visit, just to see what I could see. It was later in the morning, and the birds were starting to get quiet, but the insect activity was beginning to pick up. I’d paused atop a rock outcrop, beside a dead tree, to decide where to go next, when I noticed this fabulously coloured wasp low down on the tree. Looking more closely, it wasn’t a wasp at all, but a moth! Moths in the family Sesiidae are called clearwing moths, and they’re mostly all wasp mimics. As you can see, they do a very good job of it! They are day-fliers, visiting flowers while the sun is up, and are generally uncommon. Only one species regularly comes to lights at night, so they are rarely seen. I considered myself lucky to have stumbled across this one, which appeared to be newly emerged from what looked like half a cocoon tucked into a crack in the bark. I’m uncertain of the species; I reviewed the plates at the Moth Photographers Group Sesiidae page, but saw no all-dark species with red highlights and long, trailing yellow legs. 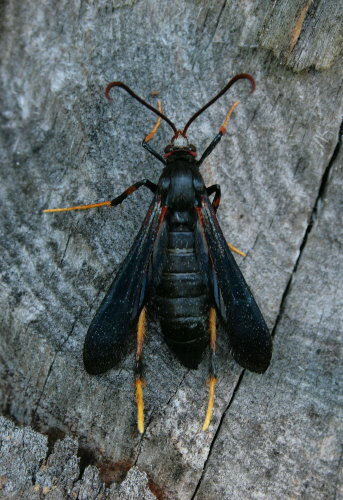 Some of the clearwings are variable, though, and it may be a variation on one of the species there that’s just not illustrated. Hard to believe that’s a moth! Congratulations on finding it. Each day outdoors is just like a treasure hunt, and you never know what you will find. Thanks for showing us this remarkable creature. Seabrooke- This is very cool. 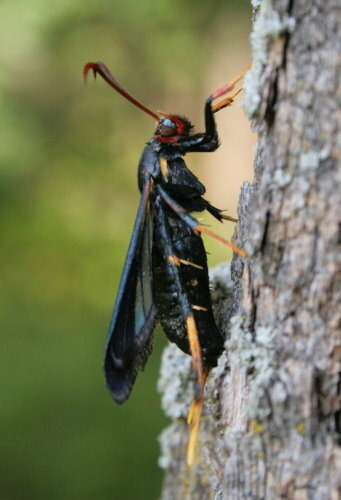 I’m going to be on the lookout for moth wasp mimics, I didn’t know there were such things. Excellent find! This kind of mimicry fascinates me. I suggest Podosesia aureocincta, a late-season cryptic sibling of the more common ash clearwing (Podosesia syringae).